We have been waiting a few years for a new Thor movie. 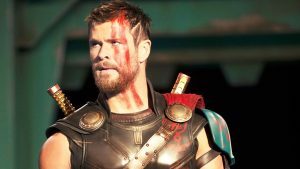 Thor: Ragnarok – Trailer Number 1 has dropped and damn… Take My Money! Watch it then read on. Ragnarök is a series of future events, including a great battle, foretold to ultimately result in the death of a number of major figures (including the gods Odin, Thor, Týr, Freyr, Heimdallr, and Loki), the occurrence of various natural disasters, and the subsequent submersion of the world in water. After Ragnarok, the world returns and the world is repopulated by two human survivors. Almost and end of the world beginning of the world – Revelation – Noah’s Flood – Garden of Eden mashup is the Judeo-Christian reference helps out. The Players – not a full listing but consider it a tasting. 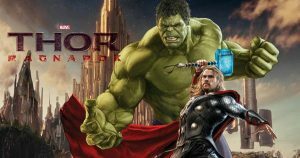 Hulk – Mark Ruffalo – We get another Hulk Thor rumble in this one. I don’t know that we will have any Bruce Banner time but at the end of the trailer when Hulk and Thor meet in the middle of the arena. Hot Damn! Loki – Tom Hiddleston – Potentially my favorite part of the early Marvel Cinematic Universe has been: Loki. From bad guy to not as bad guy, he has been a terrific foil to our protagonists. Tom Hiddleston rules. Heimdall – Idris Elba – I hope that the give Idris Elba some more screen time. From the trailer, we are going to see him in action. Very exciting. Sif – Jaimie Alexander – Lady Sif, nuff said. Odin – Anthony Hopkins – I don’t think you can actually have Raganrok without Odin…Like the event, not the movie. Dr Stephen Strange – Benedict Cumberbatch – WTF! Doc Strange in Thor. wOoT! 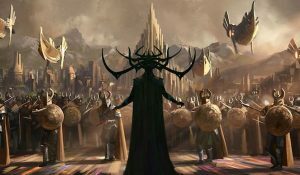 Hela – Cate Blanchett – All I have to say is the fact that Hela is wearing the full headdress is yet another finger given to Warner Brothers by the MCU. They would never try it. 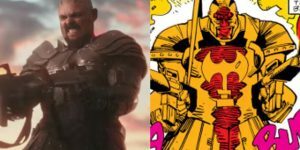 Skurge – Karl Urban – I hope that I like him more than I did in Judge Dred. Skurge has always been one of my favorite Thor baddies. Valkyrie – Tessa Thompson – She was the love interest in Creed. She is Valkrie in Thor: Ragnarok. I wonder if they will let her actual name slip: Brunhilde. Grandmaster – Jeff Goldblum – Freakin Jeff Goldblum has made it into the MCU. And he is going to be the Grandmaster, the gamemaster of Marvel Universe. Needless to say, I cannot wait for November 3, 2017. Thor has been a favorite character of mine in the comics for a long time, Chris Hemsworth was born to play this role. Damn fine movies. Bring it on.